The theoretical facet of architecture pervades all of the Italian Giorgio Grassi's work. 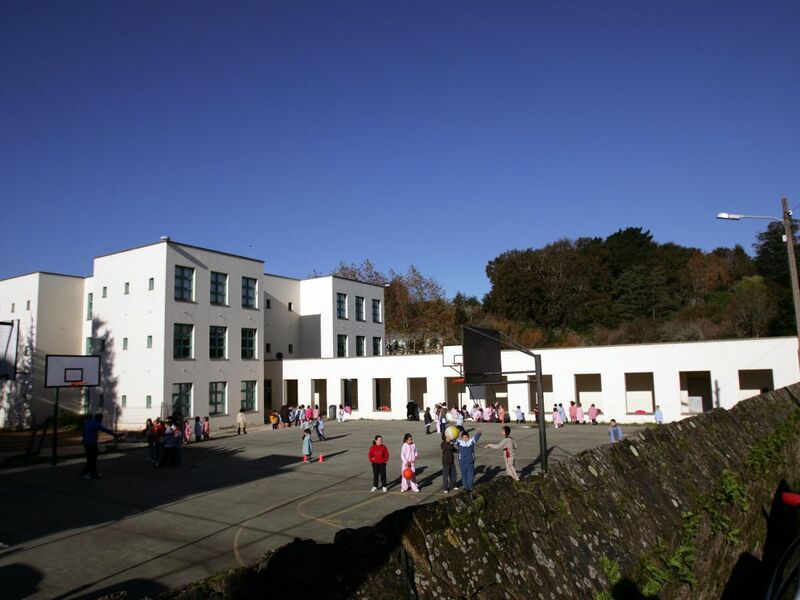 His idea that the principles of architecture and unique and immutable is reflected in all of his work and, logically, in his conceptual project for a public school in Compostela. Built in a garden bordering the historical city, the severe building reveals, in its symmetry and regularity, the values of timelessness that enable it to appear at the centre of the plot as a solid serene volume without surprising forms. As if it had always been there. One of the main inspiring elements of this building is the volume of on old suburban villa, near the building, bordering the River Sarela. Its forms' capacity for dialoguing with the surrounding landscape evoked the characteristic outline of the school's four towers. The Raíña Fabiola Public School, in Santiago, along with the controversial intervention in the Roman theatre of Sagunto and the university library of Valencia are Giorgio Grassi's three only projects in Spain. Visits: Authorisation is required from the headmaster's office.